LIFETIME LEASES AVAILABLE ON NEW HOME PURCHASE $299.00 per MONTH for 1st year (utilities not included) then $299 per month + annual increase of CPI or $10.00 per month (whichever is greater), expires 12/31/19. We feature Champion and Jacobsen Manufactured Homes. 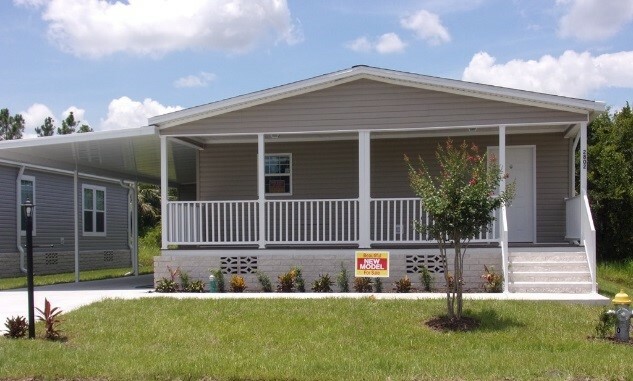 Come see this 3 bedroom/2 bath version of our most popular model! Features- Large island, open concept, warm brown tones, no carpeting, 36 in doorways throughout, private toilet room in master and tiled shower. Charming 2 bed/2 bath home features a peninsula bar in the kitchen, 3 closets in the master bedroom, and walk in shower in master bath. Very spacious home features a large living room, dining room and kitchen, island with raised bar and sink, abundance of cabinets and counter tops, French doors going into the den, spacious rooms and closets, ceramic tile in the master shower, plenty of storage throughout. Beautiful, spacious home features 36 in doorways, open concept floor plan, large island, pot & pan drawers, pocket doors on 2nd & 3rd bedroom closets, solar tube, large ceramic shower in the master bath and more! A MUST see! Charming home features open concept floor plan, trey ceiling in living room, island in kitchen, white cabinetry, spacious bedrooms, master has 2 closets and master bath. Plenty of cabinets/counter tops, hi-bar island, upgraded appliance package, spacious master bedroom with large master bath, and den. Large closets, beautiful PVC Plank flooring, trey ceiling in living room, ceiling fans w/lights included in master and living room. Abundance of cabinets/counter tops and drawers, island w/prep sink and seating, upgraded appliance package, two spacious master bedrooms with ensuites, and half bath for guests. Home has 9 X 18 plank vinyl tile throughout and a beautiful Diamond Delta Mosaic backsplash in the kitchen. Features many options including ceramic tile shower and multiple closets, etc. Plenty of cabinets/counter tops, island w/farmhouse sink and seating, upgraded appliance package.